An amazing photo of a WW2 Era transport/troop carrier aircraft, the C-47 Skytrain. 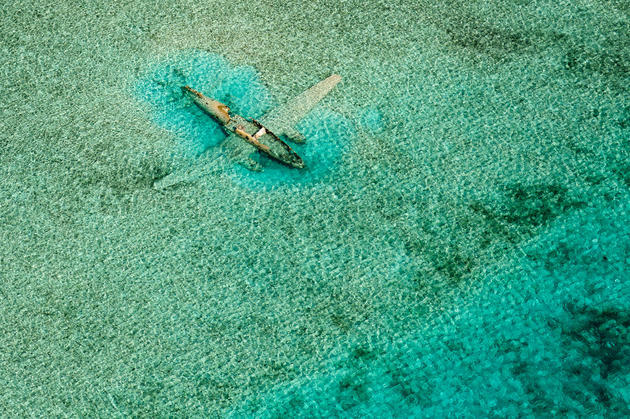 This wreck is located near to Norman's Cay, Exumas, Bahamas. This particular plane is a C-46 “Commando”. Photo by Bjorn Moerman. This post has been viewed 17,229 times. 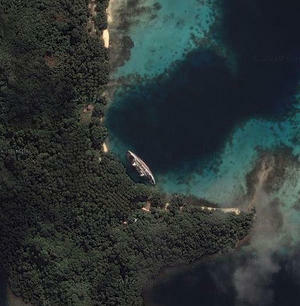 This half-sunken sea-liner is named the World Discoverer. It met its fate on April 30th, 2000, when it hit an uncharted reef in the Solomon Islands. Now it has become a popular tourist attraction and is visible from space on Google Maps.